Now there is a better way of borrowing money for less interest near you if you live in or around the Sugar Land, Missouri City, and Houston areas. We at heritage Jewelry and Loan are one of the leading lending sources with discounted interest rates for our customers. While there are many options in terms of where to go, we feel that we are the very best. Nestled in the heart of Sugar Land on Hwy 6, we are just moments away from just about anywhere. The pawn loan has been around for as long as money has. A pawn loan is a term used for a cash loan that is between a lender (pawn shop / pawnbroker) and an individual that collateral is used to secure the transaction. It’s a way of borrowing money for a short period of time without the hassles of going to a bank and waiting for an approval. At the pawnshop, the pawnbroker will evaluate your collateral and verify it’s authenticity and then assess a value to it. That value is what we call the loan value and that is what we will be offering you. It is a great alternative to other lending sources when you need short term money for some of life’s unexpected emergencies. The pawnbroker will then securely store your item until you have repaid the money you borrowed. It sounds simple because it is. A Pawn loan is a safe, secure way to borrow money. Furthermore, it requires no credit checks and allows the customer to leave with money right away. The person borrowing the money usually will bring in something of value, like some piece of jewelry, watch or gun and borrows money against its value. Generally, the move valuable an item, like gold or diamonds, the more money you can borrow. With a troubled history and a somewhat questionable representation on TV, it’s easy to see why most people overlook or cast a discriminating eye on this traditional form of borrowing. However, that is just not the case anymore. Currently, all pawnshops in Texas are required to be licensed and are governed by the Office of Consumer Credit Commissioner to ensure complete adherence to all local, State and federal laws. Therefore, all of the perceived funny business and unethical behaviors that allegedly plagued the industry are never an issue. Heritage Jewelry and Loan is no exception and is fully licensed and insured pawn shop. While serving our Missouri City and Sugar Land clients, we continually are raising the bar for all other pawn shops. All pawn loans are a contract between you the individual and the pawn shop. You will leave with a piece of paper that totally describes the item being pledged, the terms of the loan, and the timeframe in which you have to repay the money. This is the proof that the transaction took place and is the most important part of the entire transaction. In the State of Texas, the term is a 30 day loan with a 30 day extended period for a total of 60 days before the money has to be paid back. The interest rate is regulated by the State of Texas and a pawn shop can choose to charge less but never more than the State allows. These interest rates are broken down by dollar values. Interest charges are tallied up per day, so you only pay for what you use. So if you borrow money for 18 days, you only pay for 18 days worth of interest. Now what happens if you get to the 60th day and don’t have enough money to completely repay your loan? Then you are allowed to pay just the interest that is owed and extend your time, this is called an “extension” in the pawn world. You can do this as many times as you like for as long as you like. Lastly, like any traditional loan, you are allowed to pay down your loan. So for example, if you borrowed $100.00 and owed $10.00 in interest and you didn’t have $110.00 but only $60.00. Then you could pay that to the pawnbroker and $10.00 would go to repay the interest and the additional $50.00 will go to the original loan. You will then leave with a new balance of $50.00 and a lesser interest charge. Heritage Jewelry and Loan offers cash pawn loans to our customers for 10% interest per month. That is half of what the State of Texas allows a shop to charge their customers for a loan. We believe that the lower interest rate serves two important purposes. First, it helps the customer get their item back with greater ease. Secondly, it allows us to continue elevating the pawn experience for our customers buy putting their needs at the forefront. We are helping our community and making friends by being reasonable with our terms and understanding in our business practices, a true win win. We accept anything of value like jewelry, or a diamond, gold jewelry, watches, designer jewelry, guitar, musical equipment or electronics, or even broken jewelry. 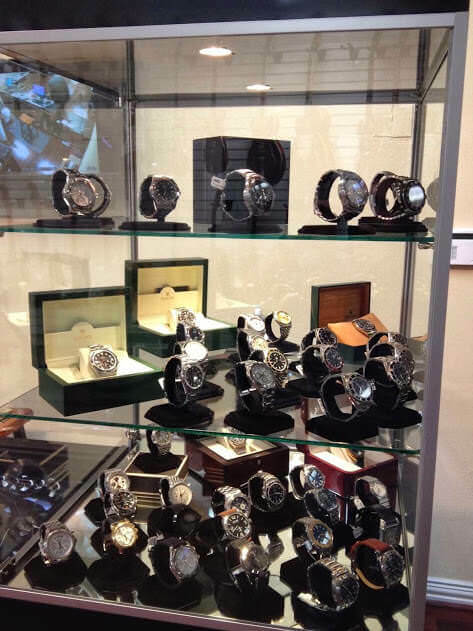 Our extensively trained pawnbrokers will give the item a loan value and share the with you. This value is what we will be lending you or let you borrow based on the inspection. If you decide to borrow the money, your valuables will be locked up in a secure environment. When you are ready to come pick it back up, your item will be returned in the same condition as you left it in. While your item is at Heritage Jewelry and Loan, you have a few options available to you. You can pay all of the money you owe and get your item back within the specified time-frame. Or you can pay interest and extend the time your item stays as the pawn shop. Either of these options is completely fine. It is up to the customer to decide which option is best for them. Your only requirement is to pay the interested accrued on the loan by the 60th day. To pick your valuable back up from the pawn shop, you will need to pay all interest owed and principle. For a more detailed explanation, please go to our Frequently Asked Questions Page. A pawn loan at Heritage Jewelry and Loan is only 10% per month on values of $1,380.00 or below. That is up to half of what the other pawn shops are charging . We supply loans up to $17,250.00 for interest as low as 1% per month in certain cases. This way of borrowing money is one of the easiest and oldest ways for a person to solve their short term financial needs. First, there are NEVER ANY CREDIT CHECKS. Failing to pay your loan will not have any altering effect to your credit score. It is instant cash without any costly waits or long forms to fill out. You can extend the time frame of your loan by paying the interest on the borrowed cash. Easy repaying options available to all clients. Custom App to allow customers to make payments on loans and check their accounts 24/7. So stop by our Sugar Land Texas location or call and speak to one of our associates about how Heritage Jewelry and Loan can help with your financial needs. We gladly service customers from Missouri City, Rosenberg, Sugar Land, Stafford, Richmond, and Houston. Heritage Jewelry and Loan is a pawn shop that lends money out for less interest that all of our competitors. We are BBB A+ rated. We will not be undersold. Serving the Sugar Land, Missouri City, Stafford, Richmond, Rosenberg areas as well as the great Houston areas.